Remember those free cards I got a few weeks ago? The guy had some more, this time almost all 2017s and 2018s. Now that I'm a vintage collector I'm not really buying modern cards anymore, so this is a great way to stay in the "current cards" game. He said he'll probably do the same thing in 2019 - buy a bunch of packs, keep a few cards and give me the rest. I told him next time I'll have some Orioles for him in return. Least I can do if he keeps giving me free cards. These are the 2018 base cards. Almost all are Series One. Not enough to finish that half of the set, but pretty close. 2017 base cards. All are Series Two. 2017 inserts and parallels. Maybe some Red Sox fan wants the duplicate Pedro? 2018 parallels and inserts. I love the Matsui insert and the gold Tanaka. The Tim Anderson card is a thicker stock and numbered to /99. There were duplicate "Legends in the Making" inserts of Bryce Harper and Giancarlo Stanton. Maybe if Harper signs with your team you will want that card? Finally, a few leftovers from the older packs he had included last time. These are almost all stars - Brett, Bonds, Canseco, McGwire, etc. The 1991 Ultra Team Chris Sabo was the only one I needed out of this lot, but there's some decent junk-wax trade fodder here. The front: Looks like a windy day, as both Camp’s hair and the palm trees behind him appear to be blowing in the wind. The back: West Georgia College became the University of West Georgia in the 1990s. 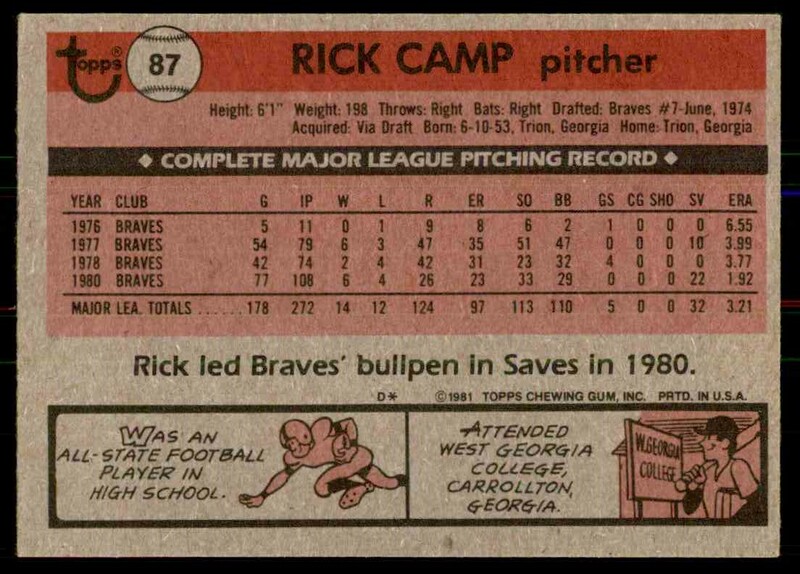 The player: Camp was the Braves’ closer in 1980 and 1981, and pitched in their rotation from 1982 to 1984, but is best known for his 18th-inning grand slam against the Mets in 1985, his last big league season. The man: In 2005 Camp was sentenced to three years in prison after he and four others, including a former Georgia State Representative, were convicted of attempting to steal over $2 million from a community mental health center. Camp died of natural causes in 2013. My collection: I have 21 of his cards, from 1977 to 1986. 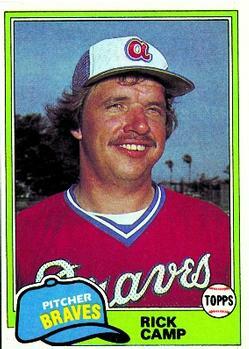 I would be interested in trading for 1983 Fleer Star Stickers #82. 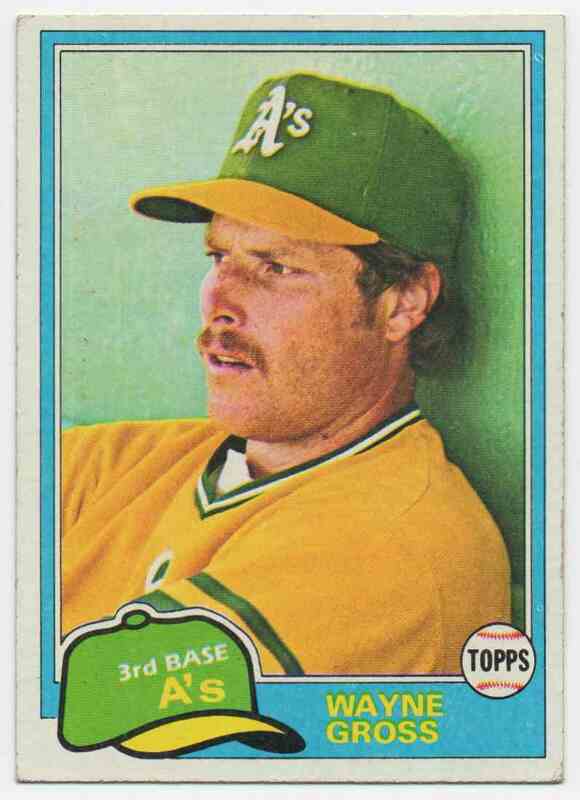 Some '76 commons. My favorite is Rich Coggins at Yankee Stadium East (aka Shea Stadium). Tom Hilgendorf gets me one closer to completion on '75 - just 21 left to go. A few '74s including a couple of Hall-of-Fame managers. Some '73 commons. I love the photos on the Bryant and McAuliffe cards. I saved the best for last - two of the biggest names in the '73 set, even though they couldn't be two more different human beings. Getting a vintage Clemente base card is really fantastic. Here's a couple of '61s with some nice stadium backgrounds. The players are in home uniforms which makes IDing the stadium a snap. In both cases it is ballparks that did not host a lot of cards in this era. In 1960 the Indians were playing in Cleveland Municipal Stadium. In 1960 the Phillies were playing in Connie Mack Stadium. I love finding Bell Telephone signs that are still in existence. I've found a few and I post them every time. 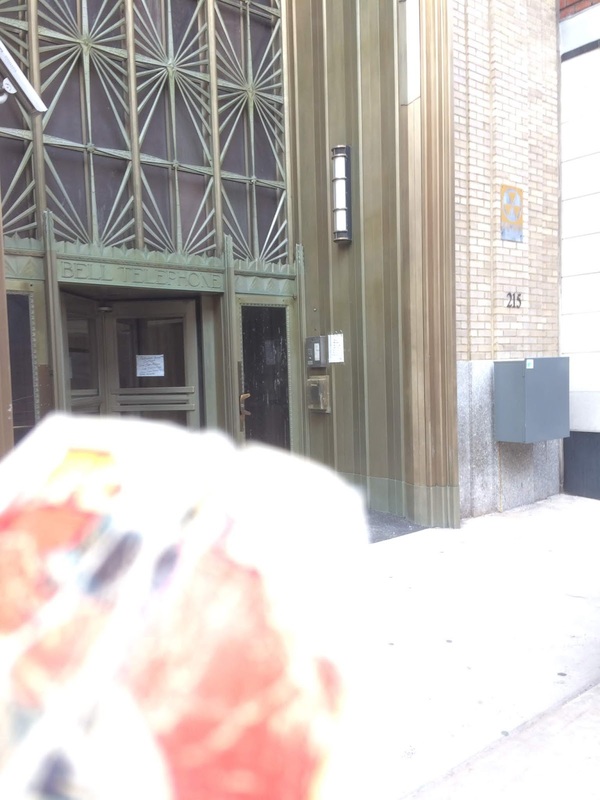 This one is still a phone building, a Verizon building on West 17th Street. Also visible here is another fading relic of the recent past, a fallout shelter sign. The front: A concerned-looking Gross in close-up along a green wall. 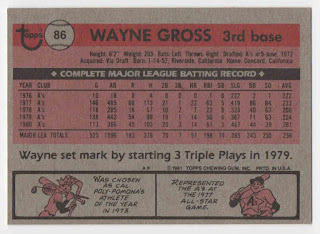 The back: Gross started three triple plays between May 7 and June 23. He never started another one, though he participated in one in 1983. 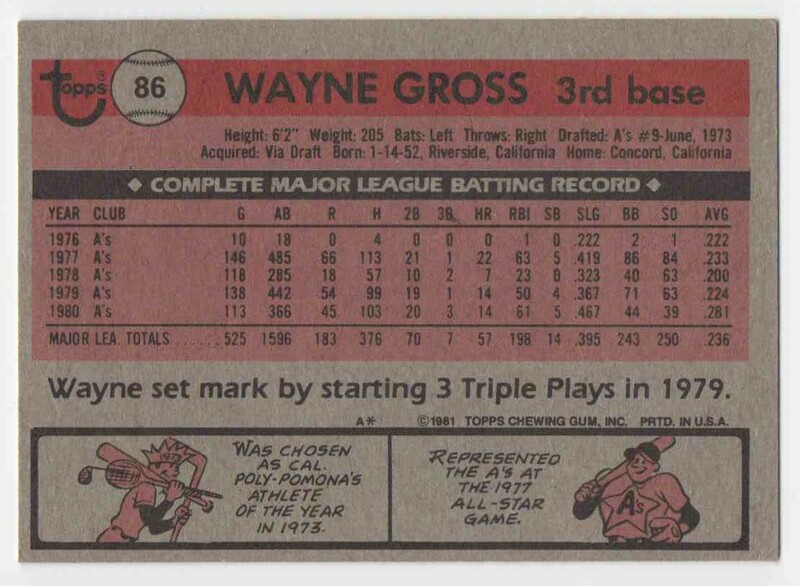 The player: Gross was an All-Star in his rookie year of 1977, hitting .233 with 22 HR and 63 RBI. He played several more years on the mostly bad A’s teams of the late ‘70s and early ‘80s, but didn’t match those power numbers until being traded to Baltimore in 1984, where he hit 22 HR again. The man: Gross was a youth coach for many years. He also appeared in the movie Angels in the Outfield. My collection: I have 23 of his cards, from 1977 to 1986. 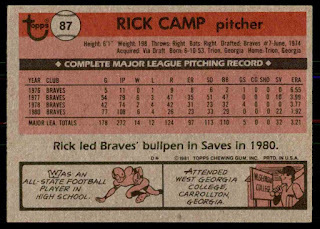 I would be interested in trading for 1984 Fleer Update #45.